Venezuelan President Nicolas Maduro breaks diplomatic relations with the US after Trump recognizes opposition leader as president. Venezuelan President Nicolas Maduro on Wednesday announced he was breaking his country’s diplomatic relations with the United States and gave American diplomats 72 hours to leave the country. 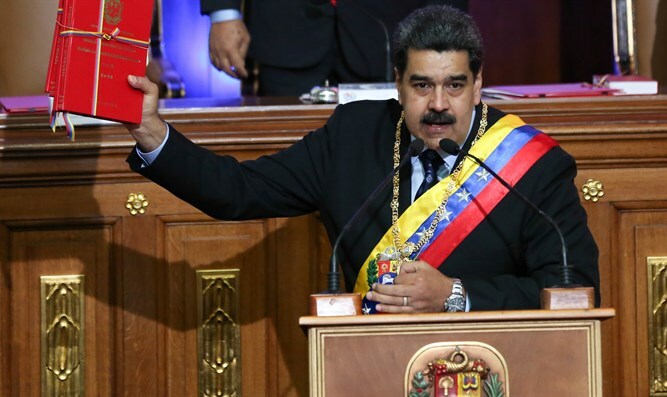 His announcement came after US President Donald Trump recognized opposition leader Juan Guaido as interim president and called on Maduro to step down. "Before the people and nations of the world, and as constitutional president.....I've decided to break diplomatic and political relations with the imperialist US government," Maduro told a crowd of red-shirted supporters gathered at the presidential palace, according to The Associated Press. The comments came after Guaido, the head of the opposition-controlled congress, declared himself interim president and called elections. The bold challenge to Maduro's rule immediately drew recognition from the Trump administration, which called on Maduro to resign and said it would use the "full weight" of US economic and diplomatic power to push for the restoration of Venezuela's democracy. Canada, Brazil, Colombia and several other Latin American nations followed suit in throwing their support behind Guaido. Guaido's declaration came as tens of thousands of anti-government demonstrators poured into the streets on Wednesday, accusing Maduro of usurping power and demanding he step down as the country reels from a crushing economic crisis that has forced millions to flee or go hungry. Trump, Vice President Mike Pence and Secretary of State Mike Pompeo all issued statements proclaiming US recognition of Guaido and saying the US would take all diplomatic and economic measures necessary to support a transition to a new government. Later, Trump stated that "all options are on the table" if Maduro does not step down peacefully. Venezuela has been rocked by protests and civil unrest in recent years as the government's socialist policies have caused the country to sink into economic ruin. Inflation has run rampant and there is a shortage of basic commodities such as food. In 2017, the US imposed sanctions on Maduro, freezing all his assets in the US, and prohibiting Americans from dealing with him. The outspoken Maduro has insulted his political opponents as "heirs to Hitler" in the past, and has been frequently accused of anti-Semitism. In 2014, he twice expelled American diplomats from Venezuela, claiming they were encouraging protests against him by opposition groups.